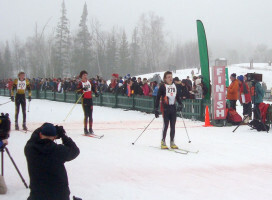 Alex Turner races down a hill in a competition this past winter. Since Alex Turner was 3-years-old, he has been zooming down hills on his downhill skis. Now, as a freshman on the alpine ski team, he recently helped his team compete at sections. Turner learned to ski from his dad, who was a traveling ski instructor. In seventh grade, Turner began to compete at the high school level. Although he mainly skis at Highland Hills with the ski team, Turner’s favorite place to ski is in Colorado, which he has done only once. 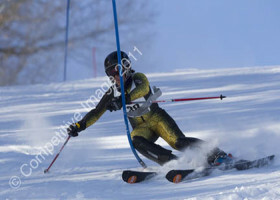 “I have gotten better at skiing, and more confident this year,” said Alex. According to Alex, he has also worked at the way he thinks about racing mentally. By getting into the right mental frame of mind, Alex thinks he has been able to ski in races as quickly as he does during practices, which is something he is really proud of. “He talks about [skiing] all the time, but I try not to listen,” said Alex’s twin sister, Laura. She is a Nordic Skier, and sometimes the two of them disagree about which sport is more difficult. “He insists that his sport is better than mine,” added Laura. 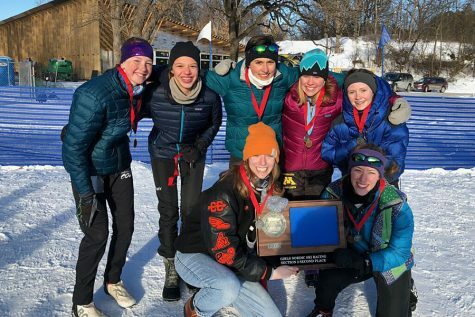 “[Nordic skiing] takes more effort than just going down a hill.” The Turner’s parents pushed both of their kids for alpine skiing, but Laura opted to try nordic after running cross-country in the fall. “The skiing [was] good this year,” commented Alex. South, Southwest, and Washburn all practiced together but when it came time for races, South and Washburn were one team against Southwest. Alex said that this makes it more competitive, but racing against friends makes in more fun. “We do better because we are racing against each other,” he said. Alpine skiing is all about the preparation. To physically prepare for a race, Alex works on his strength and agility. But on race day, the most important part is your mind set, according to Alex. With his headphones on, Alex doesn’t talk to the other skiers, only focusing on preparing for the race. Waxing and brushing his skis in this focused silence gets him ready to race. Another thing that helps, said sophomore teammate George Thome, is a lot of sleep and a good breakfast. 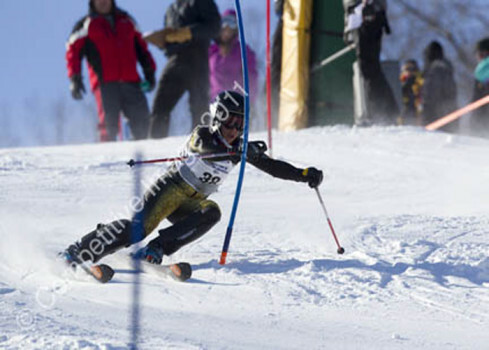 “Alex is very enthusiastic,” commented Thome, which, he added, is a helpful attribute to have on the ski team. Both Thome and Alex agree that although the team had a great year, the lack of alpine skiers affected the team. This year, there were four people on the team. The team is small after losing several seniors who graduated last year. Now that the high school season is over, Alex will continue to participate in his club team, which ends later in the school year. During the summer, he works as a caddy to pay for ski equipment and he also does a lot of weight training. Alex is one great kid!! Alex is very dedicated to his sport. I hope there are more team members next year!